Link to main University page. Dr Daniel Brown is a Chartered Psychologist of the British Psychological Society and a Fellow of the Higher Education Academy. Dan joined the Department of Sport and Exercise Science in January 2017. He completed a BSc (Hons) Psychology at the University of Bath, an MSc Psychology of Sport and Exercise at Loughborough University, and received his PhD from the University of Bath. Dan’s doctoral research focussed on developing an understanding of thriving in humans and the application of this knowledge to sport performers. 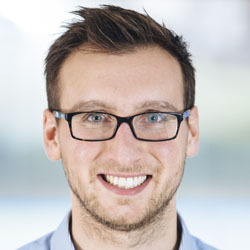 Through his research, Dan has achieved various prizes including the H.T.A Whiting Undergraduate Dissertation Prize (2011); the 2017 British Psychological Society Division of Sport and Exercise Psychology PhD Award; the 2018 Association of Applied Sport Psychology Doctoral Dissertation Award; and the 2018 Society for Sport, Exercise and Performance Psychology, APA Division 47 Dissertation Award.